Critics say the move will eliminate leadership rural communities rely on. 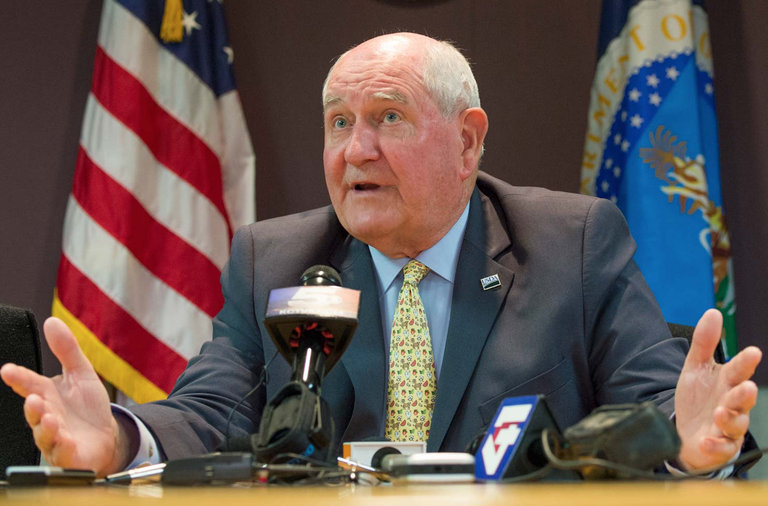 In a congressional hearing earlier this month, the new Secretary of Agriculture, Sonny Perdue, was asked why he had eliminated the undersecretary for Rural Development. The undersecretary oversees a $216 billion portfolio and 47 state offices that serve rural Americans on a wide range of vital issues from water access to housing. Perdue said he is getting rid of the position not because those issues are unimportant, but because he wants to elevate the office to greater prominence with direct access to the head of USDA, himself: “I’m just curious enough and jealous enough I want to be involved (personally in the Rural Development office),” he said, smiling. Many rural advocates, though, say the reorganization is more a demotion than an elevation and could leave rural communities in the lurch. The change is part of Perdue’s way of “improving efficiency, effectiveness and accountability,” according to the USDA’s May report on his broader reorganization of the Department. (Former Undersecretary Lisa Mensah is now CEO of a national nonprofit that helps disadvantaged communities access capital and loans.) It’s unclear what exact impacts this piece of the restructure will have: Rural Development staffers will now report to an assistant secretary within Perdue’s office. But for a president elected by over 65 percent of voters in rural areas, his administration’s apparent downgrade of the only federal office specifically dedicated to those communities seems ironic at best. Agriculture Secretary Sonny Perdue answers media questions during his first official trip as secretary to the U.S. Department of Agriculture in April 2017. Federal assistance for rural America has roots dating back to the early 20th century when the government helped impoverished farmers during the Great Depression. As food production diminished as a primary driver of rural economies in the ‘70s and ‘80s, non-agricultural programs became more central to U.S. rural policy. Today’s Rural Development office was formed in 1994 with three mission areas: housing, business development and utilities — which includes water, electricity and broadband. A hit to D.C. leadership could also leave room for more political influence at the USDA state office level, Keasling says. For instance, a larger, more expensive, higher-visibility project might pay more political dividends than multiple smaller ones in remote areas. An undersecretary can help make sure those small projects get equal attention. “The undersecretary has the ability to make sure (state directors) are meeting national priorities rather than just priorities they see for themselves and for the folks that help them get where they are,” he says. The planned elimination of the undersecretary is compounded by the fact that President Donald Trump’s 2018 budget proposal includes a 21 percent cut to the USDA and a 26 percent cut for rural development programs within the agency. Within that is a $95 million slash to an important component of the Rural Development office, the Rural Business-Cooperative Service. The service created or saved over 52,000 rural jobs in fiscal year 2015 and supports programs such as microfinance and grants for farmers to produce value-added products. “Programs like that can boost economic activity in rural communities,” says Anna Johnson, a policy program associate at the advocacy group Center for Rural Affairs. Trump’s reasoning for the cuts are that the service duplicates other efforts, has two loan programs that are mismanaged, and its results have not been adequately evaluated. The proposed budget says “tax, regulatory, and infrastructure policies” will make up for the cuts. Congress has several months to debate Trump’s proposed budget and come up with a final version. The shakeup at Rural Development is part of a broader reorganization focused more specifically on agribusiness than on rural needs overall. Perdue’s new trade undersecretary is meant to help American farmers sell more of their products abroad, and “will strengthen USDA’s ability to ensure a level playing field for U.S. farmers and ranchers in the global marketplace,” the secretary testified at a House appropriations subcommittee hearing last week. The reorganization also combines the USDA’s Natural Resources Conservation Service, Farm Service Agency and Risk Management Agency — which currently are overseen by multiple undersecretaries and span two core “mission areas” of the agency — into a single office with just one undersecretary. Perdue says the change will make the agency more efficient: “Our customers (American farmers) will have a one-stop shop, with common leadership and one voice, to provide the services they need.” Yet sustainable agriculture advocates worry the consolidation, compounded by a proposal from Trump to privatize some of NRCS’ services, could undermine the government’s efforts to help farmers and ranchers make conservation improvements to their land.